Mark Evans has this to say “It is rare indeed to find a CO2 extract of galangal root as opposed to the steam distilled essential oil so we are truly privileged to be able to offer it here. Those of you who enjoy Asian food, especially Thai, would be familiar with galangal root (mmm, love a big bowl of tom kha gai) and its pungent, gingery taste. 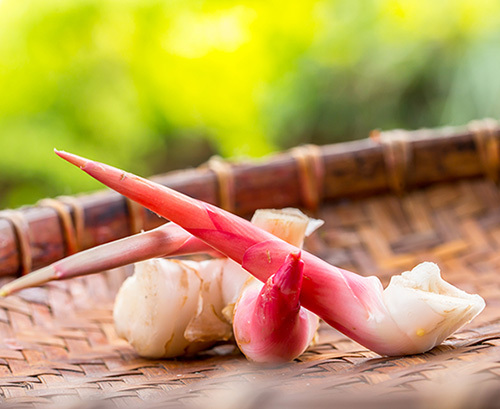 Galangal is indeed related to ginger and also cardamom and is actually sometimes called false ginger. The aroma of this special ingredient is immediately fresh, camphorous, spicy, woody, cardamom and ginger. The overall effect is of warm, zingy, aromatic spiciness that is mouth-wateringly good.